This very quiet family highlighted the desire for function over form. Their daughter has special needs. So, we designed a contemporary kitchen to accommodate her. This accounts for the height of the oven and microwave and the two faucets at the kitchen sink. The overriding desire was for a kitchen that was clean and clutter-free, while also emanating a casual elegance. We accomplished this by designing straight cabinets and using a mahogany wood with modern stainless fulls for the cabinet doors. You will notice there are lots of windows- we wanted it to feel like a glass house. 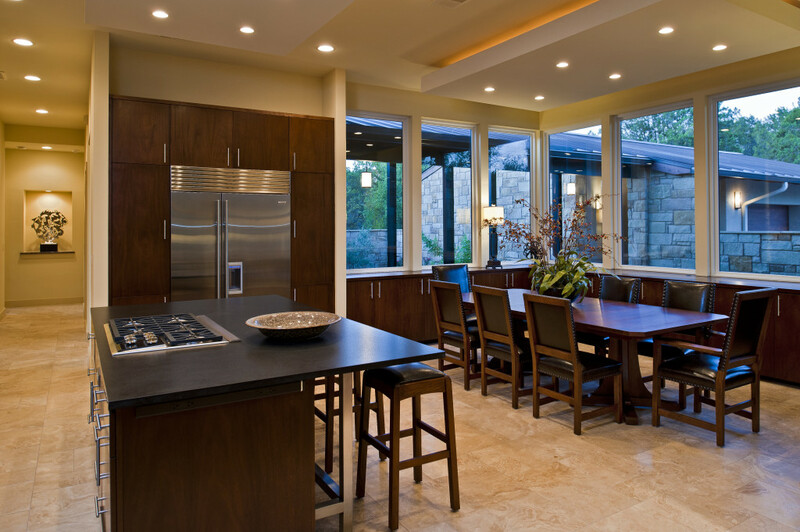 We accomplished this by minimizing the upper cabinets and allowing light to flood in over the extensive base cabinets around the perimeter of the kitchen, which provided ample space. The key to a clean, contemporary kitchen is plenty of storage, like this mahogany cabinetry, so things can be kept out of sight. The absolute black granite has a matte leather finish instead of the traditional polished finish. The glass appears to sit on the cabinets, which provide both a service bar and additional storage while maintaining a view. These windows look out into the landscaped courtyard and never get direct sunlight, eliminating the need for window coverings. This incredible design won Best Kitchen in the Parade of Homes. Click here to see more photos of this contemporary home.